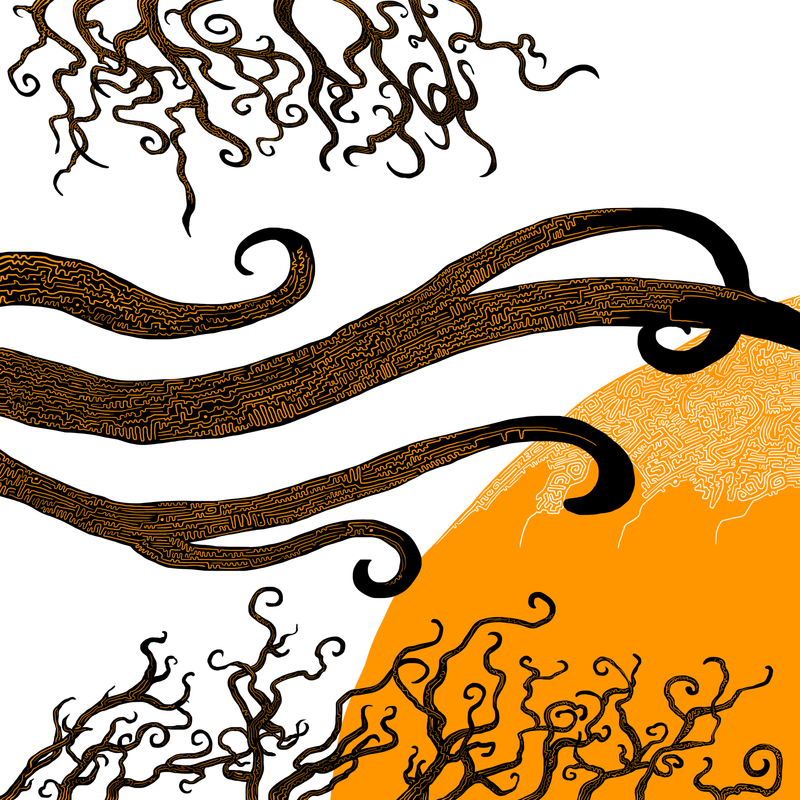 I’m not sure if I’ve yet found the theme I was looking for when I started drawing this yesterday. All three of the objects in the image (the circle, large tentacles, and the small ones) have three fairly distinct gold patterns on them. The small tentacle’s gold patterns are quite erratic, the large tentacle’s kind of have a mechanical look, and the globe has a mix of both. I’m not finished with this this by a long shot, but I do feel that the all encompassing “thing” that will tie everything together hasn’t been figured out yet. I’ll just have to keep toiling away at this until I’m satisfied I’ve found it. Something I’ve noticed over the past year is that I really love doing repeating patterns. It’s something I can take my time with, and when I zoom out to check my progress I can see how it spreads, like a virus, until whatever it is I’m adding detail to is completely consumed by it. I kind of get into a zone when I do this, where I lose track of the time and just listen to whatever chill music I have playing. It’s only when I check my progress every so often that I get a bit of a reward, a sense of accomplishment as I take over the image one small section at a time. I love it, this process. It’s just a random thought, but it would be an interesting experiment to take some of my favorite drawings over the past year, and spend these last days messing around with them and altering them. Maybe flatten the images out so there are no layers, and just go over them with tiny details like I’m doing with today’s picture. I have no idea how that would turn out, but I guess that’s why I’m intrigued by the idea. 62 days. 62 freakin’ days. 61 days really, considering that this post itself is a few minutes or so away from publishing (yeah right, I went on writing for another 30 minutes). Where has the time gone? For my entire life I’ve felt like I haven’t changed all that much from when I was just a kid. Over the years I’ve thought back to my past, and the seams are kind of invisible. I’ve just been me. I’ve realized over the years that my memory is sometimes shockingly good, and yet… I can’t remember who I was or how I felt right before I started this project. I’m not just saying this, I really feel that I can’t remember what has changed. 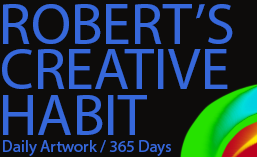 Does that mean the change, because of this Year of Creative Habits project, is just that significant? Maybe I’m very much a different person. I’m not sure if other people that have known me all my life would agree with me. Bah. I have a few more months to figure out how much I’ve changed, so on my 365th day I’m sure I’ll go over all of that. One thing is for sure though, I’m more focused than I used to be. I know I’m just as motivated as I was when I started, because I’ve believed from the start that I could complete this project. That hasn’t changed, besides a couple moments recently where I was having Internet issues and I thought I would have to miss a few posts. My focus has been at an all time high though. I feel that I really do treat this as a full-time job now. If I’m not drawing, I’m reading about drawing, watching videos on creativity, or doing general website work. Not to mention a hundred other art related things that would be too lengthy to get into right now. This “business” is all I think about anymore. I used to spend a lot of my time playing video games, watching movies and television shows, and generally doing things that won’t necessarily do anything for me. I still do all of those things, as I haven’t had to give up any of my hobbies. However, now when I play a video game (Lately, it’s been The Witcher 3), or watch a television show, or any leisure activity really, I tend to get agitated after only a couple hours. I also understand that there’s a lot of people out there that probably spend no time (or very little time) doing these things, so maybe it’s not a big deal to them. All my life, however, I’ve spent the vast majority of my days doing these things. I remember when the TV show Lost was on the air, whenever a season finished I would go ahead and re-watch the entirety of the show before the next season began. And this was all while I was watching many other shows as well. Any other moment I wasn’t watching these shows, I was devouring video games on an almost constant basis. Now, I might buy a new video game once every 4 or 5 months. I think probably even less often than that, actually. Anyways, I’m finding today’s post way more rambly than I thought it was going to be. Maybe it’s the relaxing music that’s making me feel nostalgic. So, to conclude my nonsense, I’ll finish by saying that nowadays I’m either not as impressed or excited by the thought of a new video game as I used to be, or I’m more focused on my “job”, and trying to make something out of my existence. I watch very few television shows now, and the ones I do watch, I am genuinely excited to see what happens next, and talk about it with my friends and family. I could probably go on for another couple paragraphs about how I wish I grew up maybe ten years ago, rather than recently, but I’m going to cut this short. Also, I don’t believe in looking back and wanting to change things. Hmm… well I guess I got what I wanted to say there out in a mere sentence or two rather than paragraphs, so… that’s a good place to end this.